In the south, we love our fried green tomatoes, but that isn't the only creative way we use green tomatoes. We also like to pickle them. They keep their crunch and they are just plain good! 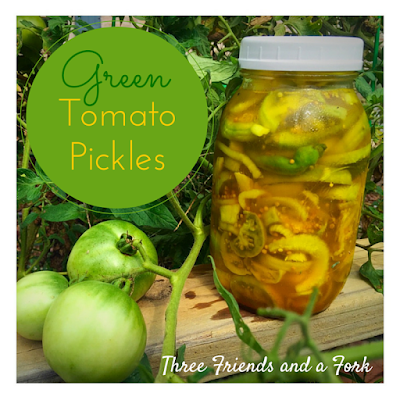 Here is my favorite recipe for pickling green tomatoes. In a large bowl, slice equal amounts of green tomatoes and sweet onions to equal 2 pounds. Larger tomatoes need to be cut in half and then sliced. Smaller tomatoes just need to be sliced. Don't slice too thinly. You want about a quarter of an inch so that the pickles can maintain their shape. To this combination, add 2-3 garlic cloves, thinly sliced and your favorite hot peppers, whole or sliced. If you use tiny peppers like Thai bird peppers, you may want to leave them whole, but if you use jalapeños, you will need to slice them. Add a few peppers if you prefer milder pickles or more if you like to spice things up. Sprinkle 2 tablespoons of kosher salt over all the vegetables, toss, cover and let stand for an hour. Pour into colander and let drain for 20 minutes. Then pack into 3 pint jars, filling to 1/2 inch from the top. 1/2 t. ground turmeric. Bring to a boil, stirring constantly until sugar dissolves. Remove from heat and let stand 5 minutes. Pour mixture over vegetables in jars filling to 1/2 inch from top. Cool completely. cover with lids and chill for at least 8 hours before serving. Serve the same way you would normally serve bread and butter pickles. Enjoy!